Try BandLab's new free mastering service and win a Strat! Free mastering gives you another reason to try BandLab. 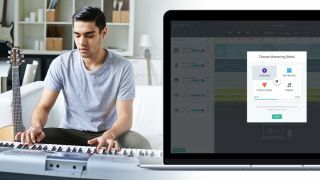 You might be familiar with BandLab, the web and app-based online social creation platform that enables you to make music, collaborate and share existing tracks with other users from anywhere in the world. However, what you might not know is that BandLab just released a new automated mastering service, which is 100% unlimited and free. Developed in collaboration with professional mastering engineers from the BandLab community, the service is powered by a signal chain that's made up of emulations of classic mastering processors. There's a model of the Aphex Aural Exciter, detailed transient shaping through reel-to-reel tape emulators, a robust multiband compressor, and a lightning-fast, discrete mastering limiter. When you master your track, you simply have to choose from one of three settings, which have been carefully configured so that you can get just the sound you're looking for. CD Quality is the most versatile, boosting the overall volume and adding polish; Bass Boost adds punch at the low end and is great for hip-hop and EDM; and Enhance Clarity brightens things up and increases clarity. While other services have claimed that their products are able to replace the need for professional mastering engineers, BandLab believes that its automated algorithmic mastering will bring more awareness and education to the art form and ultimately connect more mastering professionals with artists looking for their services through BandLab, because nothing beats the experience and ears of a professional engineer! Providing an automated algorithmic mastering service supports creators who need high-quality masters for each iteration of their creative work. It's the perfect way of adding a quick finishing touch to a track before sharing it. You don't have to be a BandLab member to try the service - just go to the BandLab mastering website, upload a track and listen to the results. If you do sign up, you'll be able to master all of your new and existing BandLab projects for free, with no limit on the number of downloads in WAV or MP3 format that also comply with the .1 dB headroom that's specified in the iTunes mastering guidelines. To celebrate the launch of Mastering on BandLab, the company is also giving away a Fender Stratocaster Guitar valued at $3,199 which can be yours just for experimenting with BandLab's new tool. Simply drag-and-drop a track at www.bandlab.com/mastering and save the track with #MusicRadar in the description to be in with a chance of winning. Full details are available at bnd.la/MusicRadar.